Standard electric radiator element are designed to warm up to an optimum temperature of 60°C to 65°C; the electric radiator element heat output tapers off and it will automatically maintain this temperature. It is important to put an appropriately sized electric element for towel rails, otherwise it may over or under achieve the optimal temperature. Thermostatic electric elements are controllable heating elements. 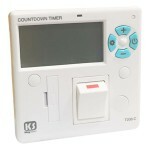 Each element has a 5 LED light display and three buttons; on/off, temperature up, and temperature down. Each LED light represents a temperature setting between 30°C and 60°C. The element also has a frost-protect function. Both types of element can be put into dual fuel applications. The benefit of dual fuel ranges are that you can use both central heating (during colder months when it may be on) and electric elements for radiators (during the warmer months) if you require an isolated unit to function independently. We offer a dual fuel T-piece, so that if you wish you can benefit from dual fuel ranges.